I asked Leeta a few questions and she was happy to answer. When and where was the first time you learned about latin dance? How many years have you been dancing? Hi Elina, Thank you for featuring me on your blog. I first started dancing when I was 15. I studied ballet, jazz, modern, improvisation at the Amsterdam School of Performing Arts besides doing high-school. I then went on to dance in a Show group performing street dance, hip hop and breakdance. The first time I was exposed to Latin dancing was when I visited the Dominican Republic in 2001. I was 19 years old and decided to go on holiday with a friend of mine. I didn’t speak Spanish and never danced with a man. When I got there, the first thing I was forced to do was dance Bachata. I was very shy and it felt awkward, but I learnt quickly as the men are very rhythmical and good leaders. What made you learn how to dance it? As I saw the passion, the joy and the challenge in Latin dance, and felt the pure love for dance in the Latin culture, I was hooked and decided I wanted to learn more and know how this dance actually worked. Merengue and Bachata I learned by practicing and by watching. 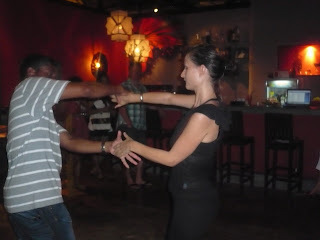 After my first two weeks in the Dominican Republic, I went on to stay for 3 months in Curacao and Aruba and there I had more opportunity to dance and learn from the more experienced dancers. After returning to the Netherlands, I took Salsa classes with a Cuban teacher named Jesus. I was very shy, but determined to learn. I met a nice guy at the classes who was a more advanced than me and together we practiced our moves and combinations at the clubs in Amsterdam. We moved on to learn other styles like LA style afterwards. Living in New York with my Colombian fiancé and his family, going out and dancing definitely helped me learn as well. Why did you move to Samui? I moved to Samui because my family had been living here for several years as Christian Missionaries. They were known on the island as “The Family International” and then later as “The Samui Family”. I come from a big family, with 8 brothers/sisters. My father’s wife was from Isan and together they ran the missionary organization here on the island. As I was very tired of living in the West, my family invited me to come for holiday and shortly after I decided to leave behind my life in Holland and join them in their charity work. 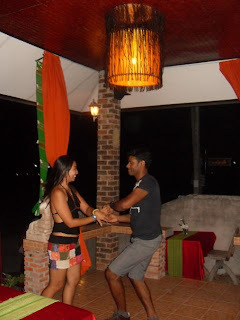 Did you consider Salsa as your daily job when you moved to Samui? I only started considering teaching Salsa 1 year after I was living here. I started out teaching my brothers and sisters how to dance hip hop and we formed a show troupe on Samui, performing at several hotels, schools and other locations as part of our charity work. The more I started dancing again, the more I realized how much I missed Latin dance. I couldn’t find anyone who could dance salsa, so I decided I would teach some people and thus have more opportunity to dance myself. Where did you start on the island? I first started out with a handful students in the dance studio of Salika Beauty in Bophut. Then went on to organize Latin parties and classes in Zico’s Bar & Restaurant. After I got pregnant, I took a break in dancing to concentrate on raising my baby and then recently started to dance and teach in Arada Restaurant, Gege Bar, and La Salsa Restaurant. How was your experience with Salsa here? I feel there is a lot of interest in Salsa. People know what it is, but I don’t think they realize how enjoyable it actually can be. I hear a lot of excitement about it, and would only like to hope this excitement would translate into a higher level of participation. I know once people learn to dance, watch others dance and try it out despite the shyness, they will be absolutely hooked. The next step I plan to take is offer Salsa retreats, festivals and holidays to Salsa dancers around South-East Asia as there is a very hot Salsa scene in many major Asian cities. OK, thank you very much for sharing with me your passion and your plans, and I am sure lots of people would find it really interesting and would be really happy to try. Thank you Elina for the opportunity to talk to you and hope to see you on the dance floor some time as well. You will always be special to me as you were my very first dance student 4 years ago here in Samui and would love to welcome you back! 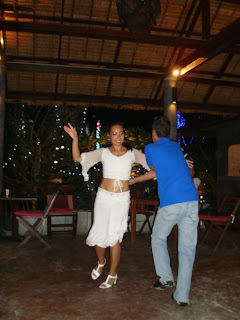 New Salsa dancing location at Latino Bar & Tapas in Chaweng Road 40 mtrs from Zico's. see: http://salsasamui.com or follow us on facebook. Currently we are teaching salsa in Maenam and Laem Sor. Come and join us. Female Escorts:doubtless that they smelled unpleasant to the king, since he insisted on baths and perfumes for the ladies (2:twelve).Meanwhile, Hadassah, an orphan, was taken in childhood to the house of Mordecai, one of the Jewish community leaders in Shushan; and he raised her sort of a Jewish princes. Hadassah remembered the horrendous experience of living as an orphan and was a cautious and cooperative woman (a pair of:7).